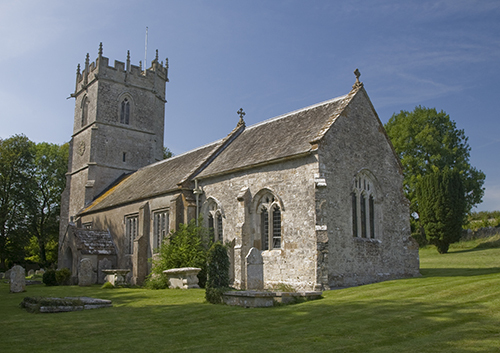 Winterborne St Martin, commonly known as Martinstown, is a village in south west Dorset, England, situated four miles south west of Dorchester, beside Maiden Castle. The village has a population of approx.754 (2001). Saint Martin's Church dating from the 12th Century with a Norman font is in the centre of the village. Other amenities include a Village Shop and Post Office, Public House (The Brewers Arms) and Village Hall. Bronze Age barrows including the famous Clandon Barrow surround the village and Maiden Castle hillfort is nearby. A stream (The Winterbourne) runs through the length of the village. The village is in the UK Weather Records for the highest daily recorded rainfall, which was recorded in Martinstown on July 18th 1955 at 279 mm (11 inches) in a 15 hour period. In 1268 Henry II granted a charter to Winterborne St Martin (Martinstown), which allowed the village to hold an annual fair within five days of St. Martins Day. The fair, which in times past was a leading horse market and amusement fair, had been revived but the old-time custom of roasting a ram was replaced once durind an event in the 1960's with a 'badger roast'. The 80 lb badger was caught in a snare and many villagers thought they were eating goose. Fairs are no longer held in Martinstown on an annual basis. The Village in recent time has held successful Open Garden Events and Craft Fayres. The village still has a very active Village Hall, hosting many local activities. After a hundred years silence, bells in the church rang out in 1947. Five new bells were hung as a village memorial to those who died in the war. An earlier peal had been sold to defray debts. The village fights to retain its rural charm. In 1980, the villagers were 'up in arms' because the vicarage was built in brick. Despite initial opposition, housing estates have now been built too. The MWMC Cycle group was formed here in 1996. 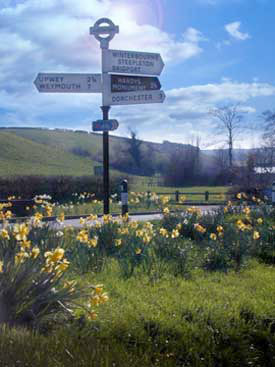 In 2007 Martinstown won the Best Kept Village in Dorset Award, in the Large Village Category. The First World War certainly made an impact on the village. There were of course no visual images to show people what was happening across the Channel. Not only was there no television news, but no radio bulletins either, nor did everyone have a daily newspaper. However many of the younger men did enlist in the army, and the result was a severe manpower shortage especially at harvest time. The school log book in 1915, 1916, 1917 and 1918 refers to continuous absences among the older boys in the summer months because they had to help with the harvesting. The log also records that the children made a collection for the Blue Cross fund for sick and wounded army horses, one pound, sixteen shillings and nine pence was raised. When at last the war ended on Armistice Day on November 11th 1918 celebrations were planned for the following year. When summer came there would be a horse race along the valley behind Grove Hill. On the appointed day all the riders and horses met on the Green. Harry Bowering, an eight year old boy at this time, can remember and name some of the riders and their mounts. Eddie Mills rode one of Colonel Duke's horses, Horace Mills was on a horse from Ashton called Sunshine, Mr Walbrin rode another, and Benny Forsey from South Rew was prepared to unharness the pony who pulled his cart and ride him, to everyone’s amusement. All the competitors rode off to the top of Grove Hill, to the start, except for Benny who walked up with his steed. Racing the entire length of the valley proved too much for some of the entrants but Benny Forsey and his pony completed the course and was first at the finish, claiming the £2.00 prize! After this excitement everyone joined the children on the Green where they were enjoying a tea party organised by the vicar’s wife. An accordion provided the music and refreshments were provided for everybody. Such was the never-to-be-forgotten celebration now that peace had come. It was quite a long time after the fighting finished before all the soldiers returned home. The school log book tells us that one pupil was allowed to be absent on October 14 1919 in order to greet his big-brother soldier on his return. Four of the Martinstown men never did return, and their names are recorded on a plaque on the Parish Office wall. This simple building was erected in their memory as the village Reading Room.